You are invited to First Friday on May 5th to view A Family Affair, art by mother and son, Marlis and James Newman at Fifth Avenue Art Gallery. This exhibit will open on May 2 and run through May 28. Both artists will be at First Friday, from 5:30 pm until 8:30 pm, to greet you and explain their processes and views on art. James Newman, Marlis’ son, has been painting since the 1970’s when he studied under Eliot McMurrough at his private art school. 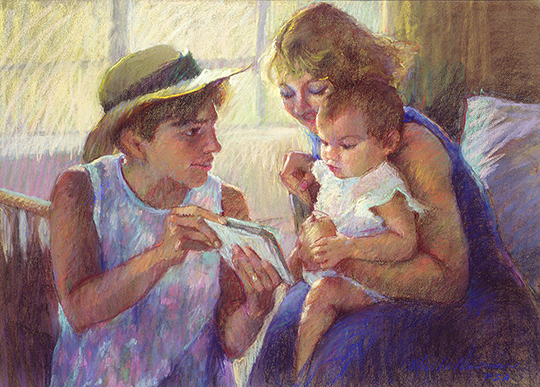 Growing up with artist parents he was provided with great inspiration and encouragement. His career as a graphic artist with the University of Florida also added to his development as a painter. James’ passion for painting comes from a fascination with and appreciation for the colors, shapes, and patterns found in nature. This fuels his love for plein air painting. Fifth Avenue Art Gallery is in the Eau Gallie Art District in Melbourne, Florida. All events are open and free to the public.